Chris Hodges, founding Principal, talks about why making buildings last longer may be the most sustainable thing to do in the May 2018 issue of FM Link. One of the most challenging (and dreaded) tasks in facility management is predicting future costs. 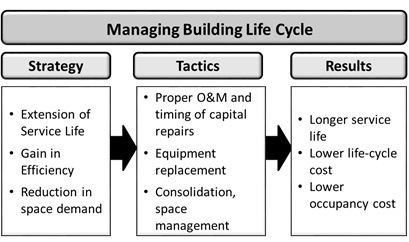 As stewards of the built environment, the facility manager (FM) must learn to manage the workplace on a day-to-day basis while predicting future needs, costs and organizational requirements. Budgeting for future costs requires some skill in economics, not just in finance. Since economic and cost factors are constantly changing, there is no single way to create a formula for success. The most successful FMs know that the only constant is change. Being an effective manager is not about having a good plan, it’s about having a good strategy. This article helps illustrate the benefits of taking a strategic approach to extending the life expectancy of our facility assets.